Though you won't make millions raising a small herd of goats, raising them still is a rewarding experience. There is much for beginners to learn before purchasing goats, including breed types, housing, feed and, ultimately, the purpose of starting your own herd. As these animals will depend entirely on you, carefully consider if this is something you will be able to maintain over the long haul. As a smaller, less expensive version of a cow, female goats can produce milk for consumption. Once a doe has kidded, or given birth, she must be milked twice a day every day. This milk then can be turned into yogurt, butter and cheese, and is a great substitute for the lactose intolerant, or those allergic to cow's milk. Farmers often give excess milk to chickens and pigs. Male goats, or bucks, also are raised for their meat. The taste of chevon has been compared to lamb meat and is sold in ethnic food markets. If the goats were raised free-range or on an organic diet, the meat is highly desired in specialty stores. 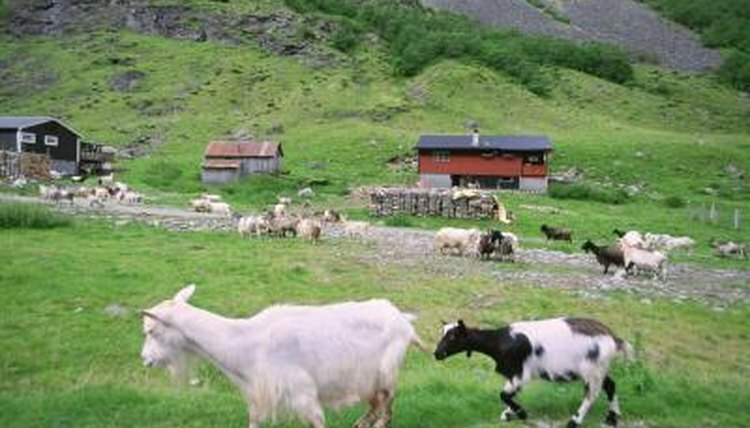 Goat fur can be used to make clothing or rugs and, as goats will eat the most stubborn brushes, they are even hired out in many areas for lawn care. Depending on the reason you want to raise a herd, certain breeds will be ideal while others, less so. It also is wise to purchase at least 2 goats from nearby farms as this means the local economy already supports this breed. Saanens, Nubians, Alpines and LaManchas all produce milk, though the quantity and quality will differ between breeds. The Boer, Spanish and Kiko are used for meat, while Angora produces fur used for fabrics. Of course, some want goats simply as pets and the small Pygmy or Dwarf goat is ideal. Keep in mind that goats purchased at auctions, or those who have to be shipped to you, may have health issues from shipping stress and confined quarters. You always should look over the goat before purchase, as these will be the greatest impact on your future herd. What many don't realize about goats is that they can jump quite high. Therefore, the pasture must have a large fence over 4 feet high. This fence also must keep out predators, like coyotes. Alternatively, a well-trained guard dog can assist in this matter. Rotating the areas of the pasture that goats are permitted on allows the land to recover and reduces potential problems with internal parasites. As for the shelter, each adult goat needs a minimum of 16 square feet. However, you will need more room once the does give birth, as the kids must be kept in a clean, dry area until they reach 14 weeks of age. The structure should protect goats from the elements, blocking the cold wind and rain, keeping out the snow and providing shade from the sun. A thin layer of bedding comprised of wood shavings and straw can coat the floor. Add shavings throughout the winter to release more heat, and muck it out in the spring. Bedding for kids, however, must be kept clean and dry. A goat will have her preference, but you must prevent her from becoming picky. Offer a weedy but leafy hay, with clover, dandelions and brush. Keeping the hay in a manger helps to prevent messes. The higher quality hay your goats eat, the less grain they will need. Though too much grain can cause health problems, a pregnant doe will need a pound each day. A vitamin or mineral block can supplement the goats diet. Don't forget to provide clean, fresh water, available to the goats at all times and bottle-feed milk to kids, weaning them off at 8 weeks of age. Adult goats in a small herd will require yearly vaccines for tetanus and enterotoxermia. They must be wormed, and given lice and tick prevention every spring and fall. Regular hoof trimmings will prevent foot injuries. While many beginners can accomplish these with a farm veterinarian, what you may not be prepared for is debudding horns, castrating males or, when the time comes, slaughtering the animal for meat. You either can sell the male kids to local farms or limit your herd only to does. Keep records of your goats, including birth dates, breeding, medications, feed and milk output to show the customers you mean business. Can a Goat Be Housebroken?